Although AirPods are still out of stock, those who waited to purchase Apple's first wireless earphones now have additional color options — 58 to be exact — to choose from thanks to aftermarket customization firm ColorWare. ColorWare introduced the new product offering on Wednesday, unveiling a total of 58 different shades, including a metallic paint palette, in both glossy and matte finishes. Available to order now, the treatment costs $289 for a pair of painted AirPods or $319 if users opt to add-on a customized charging case. The total package comes in at nearly double the cost of a regular pair of white AirPods. ColorWare defends the price point, saying the painting process is extremely difficult. Whether the firm completely disassembles each AirPod before painting is unclear, but a teardown last year revealed the device contains a substantial amount of adhesive that holds internal components together. In any case, the process is time consuming. 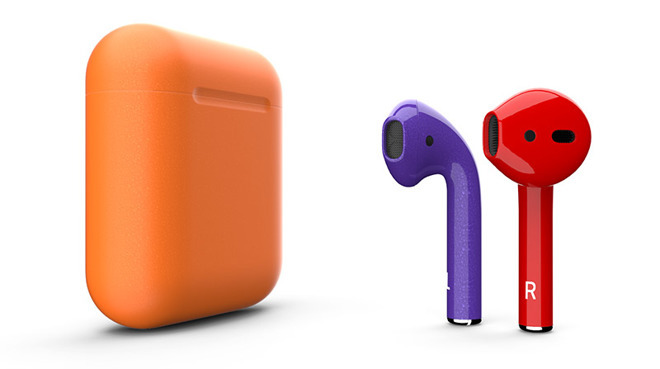 Since ColorWare gets their AirPods new from Apple, lead time on customized orders currently stands at 8 to 10 weeks. By comparison, Apple's online store is showing AirPods shipping estimates of 6 weeks as of this writing. Customers interested in picking up a pair have the option of customizing each piece separately. For example, buyers can paint a right earbud solid red, the left earbud metallic purple and the case matte green. To help customers pick out the perfect color scheme, ColorWare offers paint samples in swatches of three colors for $15. For those looking for a slightly less expensive alternative, a small company out of Brooklyn called BlackPods is marketing an aftermarket painting service — in black only — that costs $249, including the price of a new pair of AirPods. Unlike ColorWare, BlackPods lets customers send in their own AirPods for coating, dropping the price down to $99. It should be noted that BlackPods has yet to reveal a finished product, and the company's website only shows a computer generated rendering of a pair of painted black AirPods. The firm says it is waiting for their supply of new AirPods to arrive from Apple.